You notice the little Welcome sign right above the huge stone City Hall sign right? 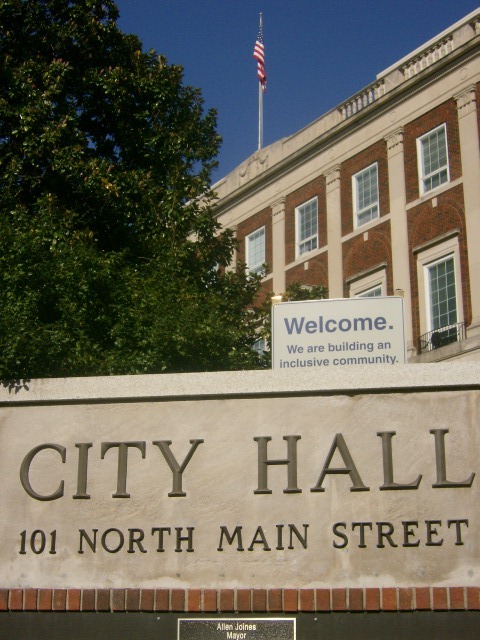 Maybe that little sign could actually be true if Winston-Salem included sexual orientation and gender-identity in its City non-discrimination policies and if the Board of Education included them in their non-discrimination, anti-harassment and anti-bullying policies. Maybe that little sign could actually be true if we didn’t have, oh… it’s Jeannie Metcalf, again, comparing gay people to rapists. I have been using the term Inclusive Community in an entirely different frame of reference in my own work. When I signed up for word press I tried Inclusive Community as a term but when it didn’t work turned to included. I hope that this does not cause problems. I am trying to start a new consulting business and it is a tentative name before I do the registration etc. I define inclusive community as one dedicated to the ideals of inclusive, socially conscious community planning where those who are socially vulnerable because of age, disability, and poverty are treated as full citizens. It is important to me that it is understood that aging, disability and poverty impacts everyone, whether male or female, straight, gay, transexual or bi-sexual. I am not trying to involve myself in larger issues but trying to learn what I need to know to serve my own small local community. I am in Calgary, Alberta Canada. I am also a person with an invisable disability, a brain injury. I graduated with a Masters of Planning in 2004 but found myself stuck. I am in a community program trying to start a business with an education and no experience. I am new to all of this.